Plucky Pass Beginnings is the first course of Episode 1, and subsequently, of Captain Toad: Treasure Tracker. It is a short grassy level with the Toad Brigade, a Shy Guy, and a wooden tower holding the Power Star. 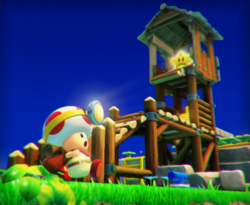 Captain Toad starts beneath a hill where the Toad Brigade rests. Then, he must walk around the corner and use a switch to raise a platform to the next level. Here, he can find three Turnips and a Ladder which leads to the Shy Guy and a Super Pickax. The pickax can break a number of stone blocks, revealing a garden of coin-yielding plants and/or a secret area with a Gold Mushroom worth 50 coins. They can also use a switch to raise the play structure to access the Power Star. Super Gem 1: In an alcove near the start of the level, which can be reached with a nearby ramp. Super Gem 2: Behind a POW block, which requires either Captain Toad to throw a Turnip at it (in order to destroy the block) or the player to tap the POW Block on the touch screen. Super Gem 3: Given by Blue Toad, who can be found on a high ledge accessible via raising the playground. The Pixel Toad is in the back side of a wall that also has a Golden Mushroom and a Wingo poster on the right. There is a hidden 8-bit Luigi located behind the arrow sign in the back of the course. It is removed from the Switch and 3DS versions of the game. The music that plays in this course is available as a track in Super Smash Bros. Ultimate.